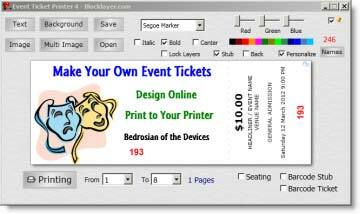 You can print different text blocks (Quotes, Quiz, Sayings, Names etc) on each event ticket. Create a comma or new line separated text (.txt) file with all the required entries in the order they should be printed. If you have fewer text entries than tickets, the text blocks will repeat after the last ticket. If you want only the first tickets to include different text entries, add "End" as the last text entry in the .txt file, and, the text space on tickets after the last entry will be left blank . Check MultiText, and browse to the file to add the entries to the Tickets. Edit font size with Mouse-Wheel, select font, color and style as normal text entries, and drag to position the text. Click the Get Demo button to load a demo file of Fortune Cookie Quotes to see how it works. When the Multi Text List appears on the designer, the longest entry in the list is displayed. Shorter entries are centered to the longest. 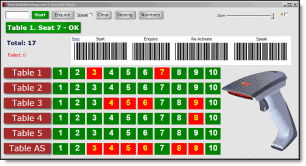 Mouse over MultiText Count to cycle through the entries. When the mouse leaves the MultiText Count, the longest entry will be displayed again, so you can make sure it doesn't cover any other objects. If you have matching Multi Text entries and Individual Images, when you mouse over the MultiText Count, the images will cycle through with the text, so you can check they match. The Multi Text entries are displayed in the order they are listed in the text file and the images in the order they were selected. You may have to re-name the images so they appear in the correct (alphabetical) order to match the text entries.